It has been four days since Eagle Nest Canyon went on a historic flood, perhaps unrivaled since 1954. 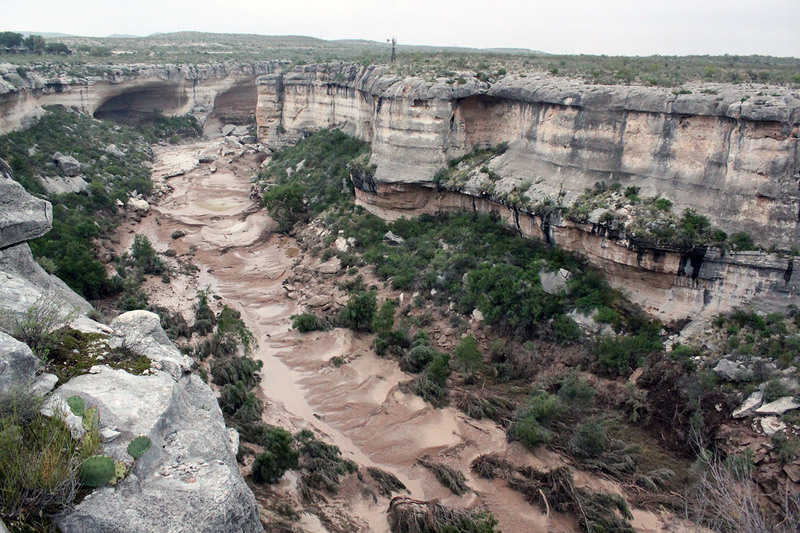 We were fortunate that it hit on a Friday morning, peaked mid-day, stalled out in the afternoon as water backed up from the flooding Rio Grande, and then most of it drained out of the canyon overnight. We were able to get back to work the next morning (Saturday) in Eagle Cave. We knew we would have to take the high trail into the canyon, but we weren’t really prepared for what we encountered when we looked over the edge for the first time. Massive gravel dunes now cover the floor of the canyon. The canyon bottom has been completely transformed. There are massive gravel bars and dunes extending downstream from Eagle Cave, and they have covered the previous floor of the canyon with several meters of gravel. The old water pump the Skiles family installed in the bottom of the canyon in the 1950s is either covered up by gravel or washed down into the Rio Grande. 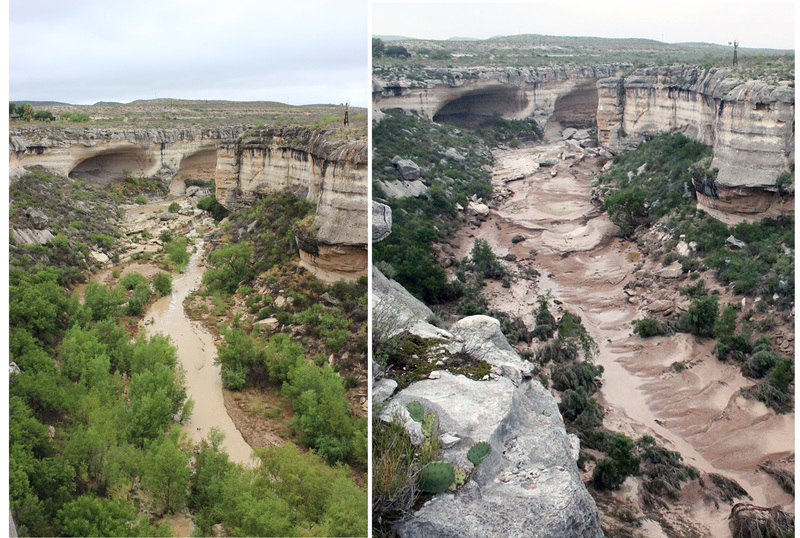 Bottom of Eagle Nest Canyon after a small flood in May 2014 (left) versus how it appeared on June 20th (right). Several hundred tons of gravel and other debris was washed down and deposited in the canyon bottom just below Eagle Cave. 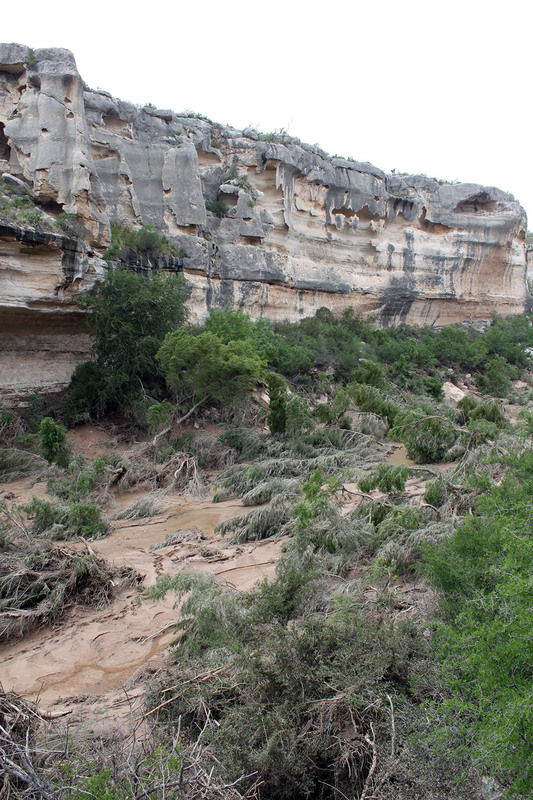 Before the flood the lower canyon bottom had many trees including willow, salt cedar, cottonwood, mesquite, hackberry, and walnut, but the flood was so strong that most were ripped out, snapped in half or flattened by the flood waters. We expect to see even fewer trees upstream from Eagle Cave once we have time to venture forth and boulder hop up the canyon. The two sites that are most affected are Skiles and Kelley — the sites are fine, but getting to them and hauling dirt, or rather mud upslope to backfill our excavation units is … challenging. For most of the season we were able to drive very close to the sites and take a short hike up the canyon wall to the rockshelters. Now, the flood has left behind a massive gravel flat with braided streams below the sites. Kelley Cave and Skiles Shelter during the small flood in May 2014 (left), and the same shelters after the flood. Fortunately, some of the denizens of Eagle Nest enjoy the mud. 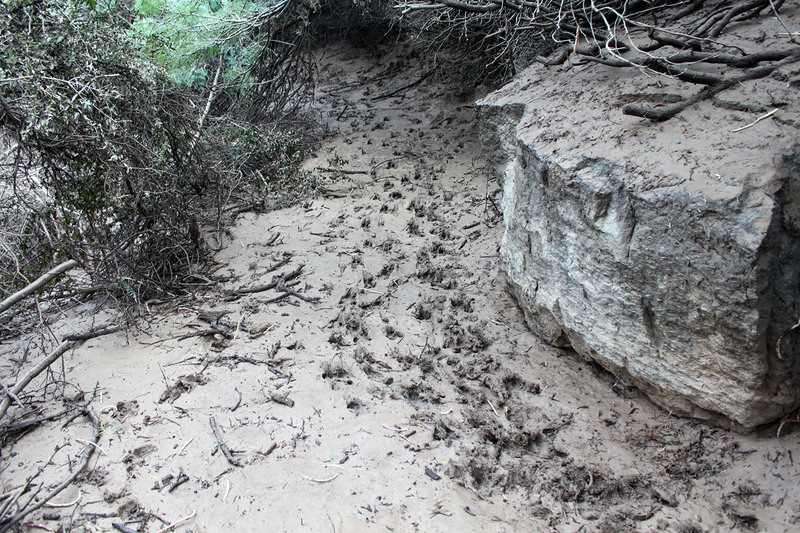 When a small crew made their way to Kelley Cave Saturday afternoon, they followed in the footsteps of wild hogs that seem to enjoy the mud, contrary to the humans who slogged after them through the sticky slick mud. Wild hogs seemed to enjoy the new mud that was on the trail into Skiles and Kelley. View looking upstream to Eagle Cave just as the surging flood waters begin to flow across the gravel-dune field in the canyon bottom. We arrived at the canyon this morning after waiting out a thunderstorm that began just after dawn and passed just north of the canyon (Jack Skiles reported only just over 1/3″ of rain in his gauge above Eagle Cave). When we drove over the highway bridge on our way to the canyon we saw water was running over the pour-off, so we knew another flood was headed our way. Sure enough, not 20 minutes later we watched the water come rushing down the canyon once again, its thin leading edge advancing rapidly and swelling quickly. 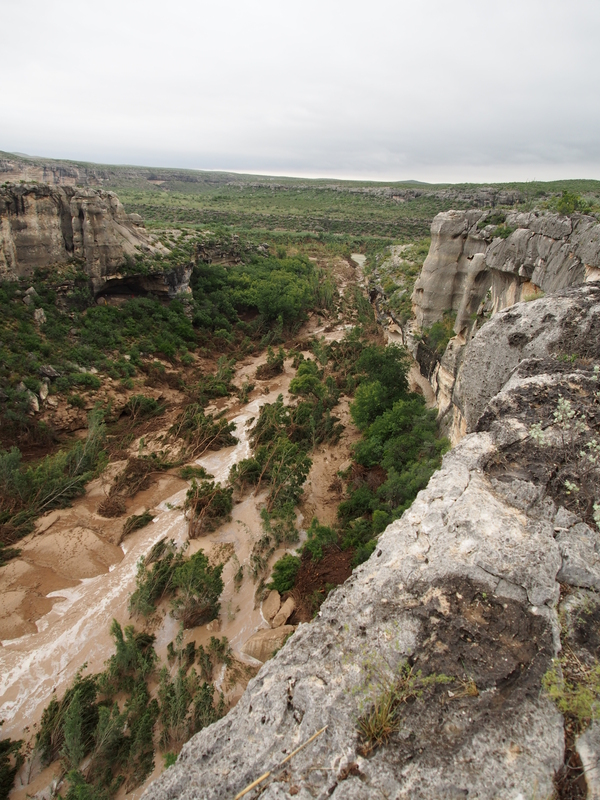 From our canyon edge perch we watched with fascination as the flood torrent breached sand-gravel banks 15-20 feet high or went around them, carving new channels that crisscrossed the canyon floor and competed to see which would capture the main flow. The small flood from today winds its way through the bent over trees and gravel dunes from the massive flood 4 days ago. The canyon ran until 1 pm, and sitting in Eagle Cave mid-morning the roaring water was loud enough that we had trouble hearing the person running the Total Data Station only a few meters away. Today’s flood paled by comparison to Friday’s (perhaps 1/20th the volume or even less), but the water encountered virgin unconsolidated territory — the gravel bars. Over the course of the day a new channel cut through the gravel “dunes” and the floor of the canyon was once again transformed, albeit less dramatically than four days hence. 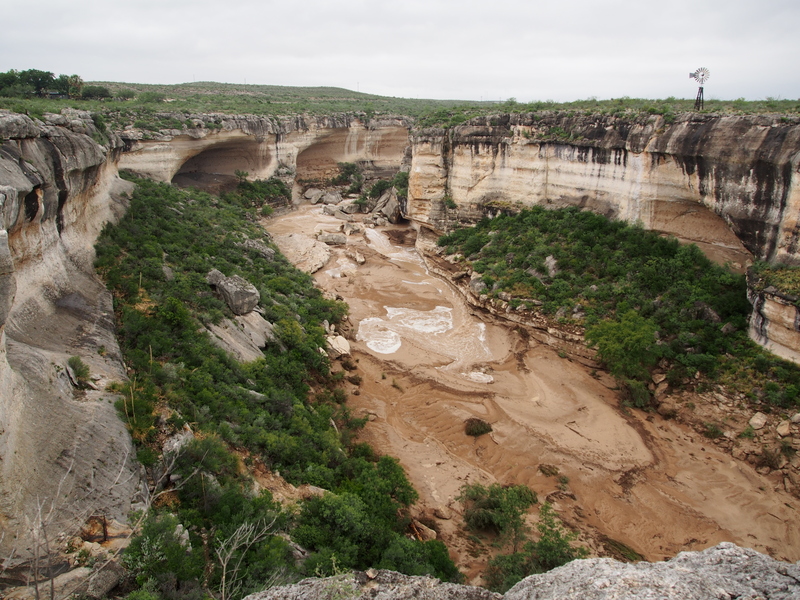 We are hopeful that our colleague the archaeo-sensing wizard Mark Willis will be able to come back out re-fly the canyon soon with his UAV to document how the canyon has changed since the flood. It is rare to be able to watch an arid landscape dramatically change before your eyes, and Eagle Nest has done that twice in four days! Even though our best-laid plans were disrupted, we felt privileged to bear witness to flash floods massive and dinky. This entry was posted in Flooding in the Canyon, Geoarchaeology, Spring ENC 2014 Posts. Bookmark the permalink. wow! You’ve witnessed the recontouring of the land in a few short days. The power of water is amazing. It has the ability to bring power, to nurture plants and to destroy everything in its path! Thanks for the amazing photos. I hope everyone in your group is fine and able to return safely home soon. Wow! So impressive! You all please be safe in your adventures! How many rattlesnakes were occupying the shelter with you all? So glad you were able to witness such dramatic events and stay safe. Most folks have trouble visualizing such transformations but your first-hand knowledge of these floods will be forever part of your makeup. Mother Nature is the best teacher!! I thought geology took a long time to happen….. can’t wait to see the “new” canyon. Some interesting events being experienced by Dr. Steve Black and his crew out in west Texas.